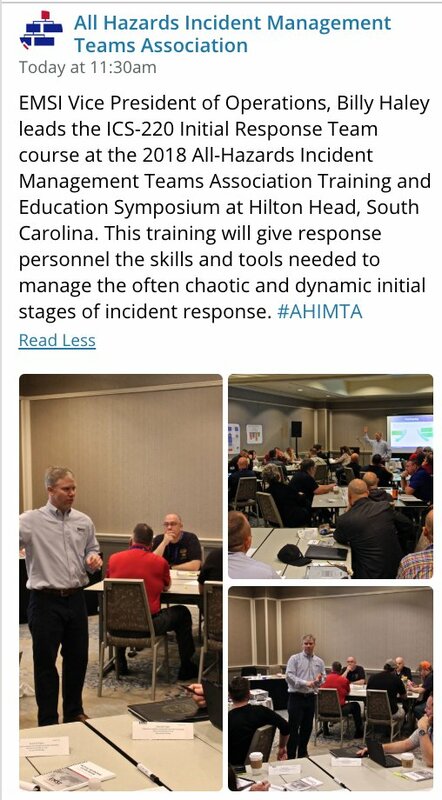 Following on the heels of an ICS-220 delivery for St. Louis County Police Department, EMSI participated in this year’s annual All-Hazards Incident Management Team Association (AHIMTA) Training and Education Symposium for the fourth consecutive year and delivered our ICS-220 Initial Response training course for the second straight year to a capacity audience. Impressed by our previous year’s delivery at the 2017 AHIMTA Conference, attendees from St. Louis requested EMSI provide a local delivery for their organization. 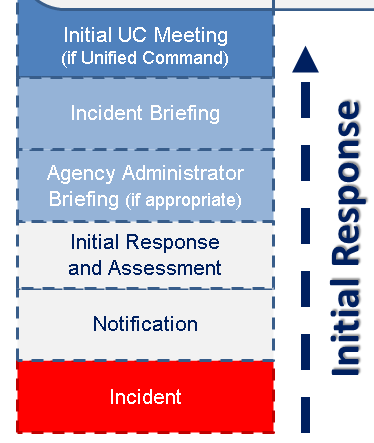 As the creator and only provider of this essential ICS-220, EMSI developed the course to address a critical shortfall in ICS training to better prepare response personnel for managing the often chaotic and dynamic initial stages of the response, with additional focus on a prolonged posture in this critical portion of an incident lifecycle. Developed in conjunction with this course, EMSI has published an Initial Response Guide Book to serve as a job aid during Initial Response. The guide book includes a plethora of ideas on how to implement process and organization in the initial response phase, while managing operations using the ICS-201 form. Since approximately 95% of all incidents never leave what is often referred to as the stem of the Planning “P” (the Operational Planning Cycle), the standard NIMS All-Hazard ICS training curriculum is substantially deficient in addressing today’s complexities in preparing responders to effectively utilize ICS in the chaotic and dynamic initial response phase of an incident. While ICS-200 is a system course intended for single resources and initial action incidents, the concepts tend to be more foundational and less practical. The next level of system training, ICS-300, quickly jumps out of the initial response phase and focuses on “expanding incidents”, while placing a heavy emphasis on the proactive, managed phase of the incident, typically referred to as the cyclical part of the Planning “P”, for Type 3 (Tier 2) and beyond incidents. Since releasing the updated ICS-220 in December 2017, EMSI has delivered the course over ten times to government and private industry clients on a global basis. Student feedback has been overwhelmingly positive, with many recognizing the ICS training shortfall this class addresses. Excellent course and well presented. The EMSI Initial Response Guide Book is a definite asset and enhanced the lecture and all activities. Good use of real-world situations to reinforce course objectives. I will highly recommend this class to my peers. I felt the subject matter bridged a gap between ICS-200 and ICS-300 to a more practical application. I would like to see my organization conduct more ICS-220 training. As advertised, this class really fills a gap in ICS training. There is no other course that I am aware of that covers initial response ICS in such detail, preparing first responders to manage the initial stages of an evolving incident. Well done EMSI! Great class, helped fill gaps in previous courses. Outstanding course. I would recommend this class for all involved with emergency management. Great course for initial responders. This was my first ICS training course and I was completely satisfied with the content and presentation. I feel like I now have a solid foundation to build ICS knowledge. This was an excellent class for me given my training, experience, and role as a first responder – in addition to my additional duty as an IMT member. Class added to my ICS knowledge. Really enjoyed class. We can use this in the future for within our organization. Gave some great ideas on how to Type 4 incidents and initial response to Type 3 or greater incidents. The exercise was great and I was really impressed by the quality of the supporting materials. All of the instructors were great. Great, engaging course. Material was well presented by people who clearly understood the material. Very good delivery. Thought provoking. Added tools to my tool box. Very good class to fill a very much needed gap. In 2019, EMSI will continue to deliver this course while working on a train-the-trainer program and licensing concept for expanded delivery. We look forward to participating in the next AHIMTA conference in St. Louis next December in our continuing quest to best prepare responders. EMSI is a service-disabled veteran owned, minority business enterprise (MBE) that supports a broad range of clients. To learn more about EMSI and how we can help your organization’s response preparedness, including exercise support, please visit www.emsics.com.